The rebound in cloud stocks has been fast and fierce, which didn’t really give investors a chance to load up on their favorites. Or should we say, when the opportunity presented itself, such as with Adobe Systems (NASDAQ:ADBE), not enough investors took their chance. So are investors out of luck with ADBE stock? I wouldn’t say investors are out of luck, but they’ve likely missed their best buying chance of the recent correction. The one thing we can all hope for is a retrace of some or almost all of this rally from the Christmas Eve lows. The market does one thing really well, and that’s cause as much chaos as possible at certain times. Our first reason for buying Adobe stock comes from the charts. Markets barreled lower into Christmas, capitulating on the eve of the holiday. However, investors couldn’t decipher if the next week of trading was simply a dead-cat bounce happening amid low volume during the typical Santa Claus rallying period. A few days into January and stocks were still climbing, causing many to wait on the sidelines for the inevitable pullback. Here are we in the beginning of February and many are still waiting. Adobe stock is one that investors wish they bought when they had the chance. Just don’t make the same mistake twice if the opportunity presents itself. ADBE stock price is still $20 below its highs. 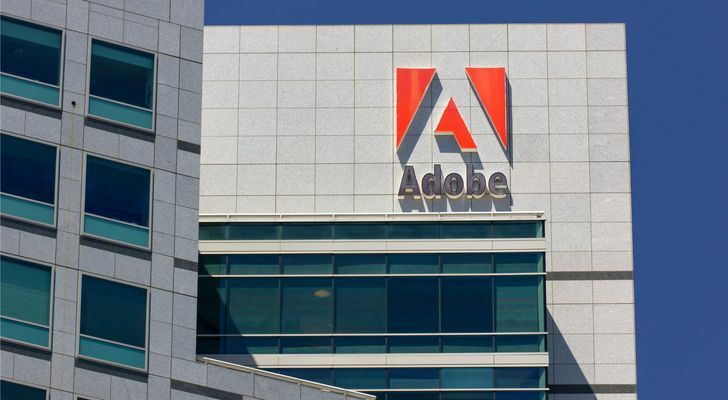 While Salesforce (NYSE:CRM), Workday (NASDAQ:WDAY) and others have been on fire, so has Adobe. ADBE is now $50 up from its lows. Investors could justify buying ADBE stock another $10 lower, near the conflux of its 100-day and 200-day moving averages. I would love a “real” correction back down to $235 or so though before really getting long this name. Adobe stock is great thanks to one thing: subscriptions. Virtually every freelancer and every business in online marketing utilizes Adobe to some capacity. Whether it’s to tidy up in Photoshop or make elaborate designs, ADBE carries the load. That’s why it has such a good pulse on the e-commerce market as well. Customers have a few options when it comes to subscribing to Adobe, but for simplicity, let’s look at the main one. A subscriber can gain access to just about all of Adobe’s products by either paying month-to-month at a higher rate or paying at a lower monthly rate but signing up for a 12-month agreement. Once the refund period has passed, Adobe will be able to collect revenue from its users month after month after month. This leads to a more stable business with more predictable cash flows and it’s exactly why its stock gets a premium in the market. Because of this subscription base and its leverage of the cloud, Adobe stock has exploded in recent years, as has its business. Revenue has doubled over the last five years while free cash flow (FCF) and cash flow from operations continue to coast from the lower left to the upper right. Over the last 12 months, Adobe has generated more than $4 billion in FCF. While Adobe does carry $4.1 billion in long-term debt, its total assets are double its total liabilities. Before Adobe reported Q4 earnings in December, it issued its 2019 outlook in mid-October. Management reiterated that it was on track to hit its fourth-quarter numbers and it’s looking for 20% revenue growth in fiscal 2019. When it reported earnings in mid-December — a top- and bottom-line beat — Adobe updated its 2019 outlook to include its recent acquisitions. Despite all this, Wall Street didn’t care, tossing the cloud juggernaut aside with the rest of the market into the Christmas Eve doldrums. Coal for everyone, they said, no matter how well the company is doing. After a quick retest of the lows, investors who stayed the course are the ones laughing now. Estimates call for full-year revenue of 28% and for earnings to swell 41.5% to $7.78 per share. Adobe isn’t just growing, it’s accelerating and that’s why it’s going to make investors even more money this year. 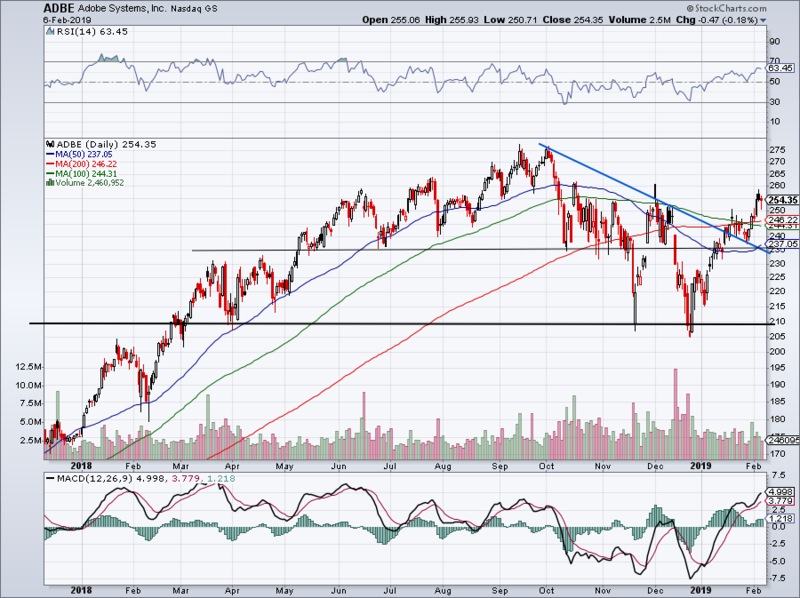 Timing an entry has been important, but it can (and should) be done in ADBE stock. Article printed from InvestorPlace Media, https://investorplace.com/2019/02/3-reasons-to-buy-adobe-adbe-stock-fimg/.